Monkey Bridge (猿橋, saruhasi) is located in Otsuki, Yamanashi. It is one of the three unique bridges of Japan. 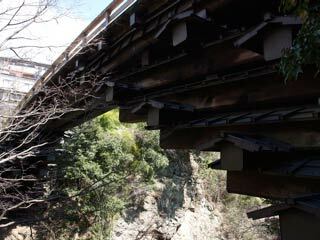 It is 30m long, 3.1m wide, and 31m high from Kakegawa river. It has great view of Kakegawa river and its valley. Because it was placed on the Kosyu Road, was very important place, and many battles took this place. Because Kakegawa River changes it water level so often, it cannot have the leg to support the bridge, so this bridge used multi layers to support the weight. This structure was used since 7th century. The name and idea of the structure were taken from that when monkeys try to reach the other side of the bridge, they built towers by themselves and reached to the other side.